First, a warm welcome to our everyday riders, new riders and visitors from out-of-town and a Happy New Year’s to everyone! •If you’re thinking about driving to the parade, please keep in mind that street and paid parking is limited near the parade route and traffic is usually extremely congested after the parade — just when people start arriving for the game. That’s why many people take the Gold Line to the parade and/or game. •Metro is running all-night service on New Year’s Eve and into New Year’s Day for those going to the Parade early; the Parade begins at 8 a.m. on New Year’s Day. All-night service will be provided on the Red, Purple, Blue, Expo, Green, Gold, Orange and Silver Lines in addition to bus lines which normally operate late-night owl service. The Gold Line will have longer trains and run more frequently usual during the busiest hours before and after the parade. •Due to the large crowds expected to come out for the Rose Parade, oversize items such as umbrellas, chairs and coolers will not be permitted on the trains that day. •Football fans can take the Metro Gold Line to Memorial Park Station in Pasadena; then take a short walk to the Parsons Parking Lot B and a free shuttle that drops you off next to the stadium. Shuttle service begins at 10 a.m. on January 1 and runs until about two hours after the game. If you are riding a Metro bus after the game, please check the individual timetables for last bus times leaving Pasadena. Game day parking at the Rose Bowl or the Parson’s lot costs $40. •There is parking available at many Metro Rail stations, including Gold Line stations — please see the Gold Line map above and the system map below. Parking at most stations is free; it’s six dollars a day to park at Los Angeles Union Station. There are also many paid parking in lots in downtown Los Angeles that are near the Red/Purple Line subway that can be used to connect with the Gold Line at Union Station. •Fares on Metro Rail are loaded on plastic TAP cards, which can be purchased from ticket machines aboard Metro Bus lines and all Metro Rail stations for $1; the ticket machines at Metro Rail stations accept cash or credit cards. Fares are $1.75 per ride on a bus or train and fares include two hours of free transfers in one direction. A day pass good for unlimited rides in a 24-hour period costs $7 per person. More fare information here. •After the parade, floats are displayed at Victory Park in Pasadena. To view the floats at the park, take the Gold Line to the Sierra Madre Villa Station, the final station on the Gold Line. Go the first level of the adjacent Gold Line parking garage t board a shuttle that provides direct service to Victory Park, where the floats will be displayed from Jan. 1 to 3. Shuttles will depart from Sierra Madre Villa until approximately 3 p.m. each day. Return service to Sierra Madre will continue to 5:30 p.m.
•Below is the Metro and Metrolink map for our area. Metro runs the area light rail, subway and bus system that criss-crosses Los Angeles County. Metrolink runs commuter rail that serves the five-county area in addition to one station in northern San Diego County (Oceanside). 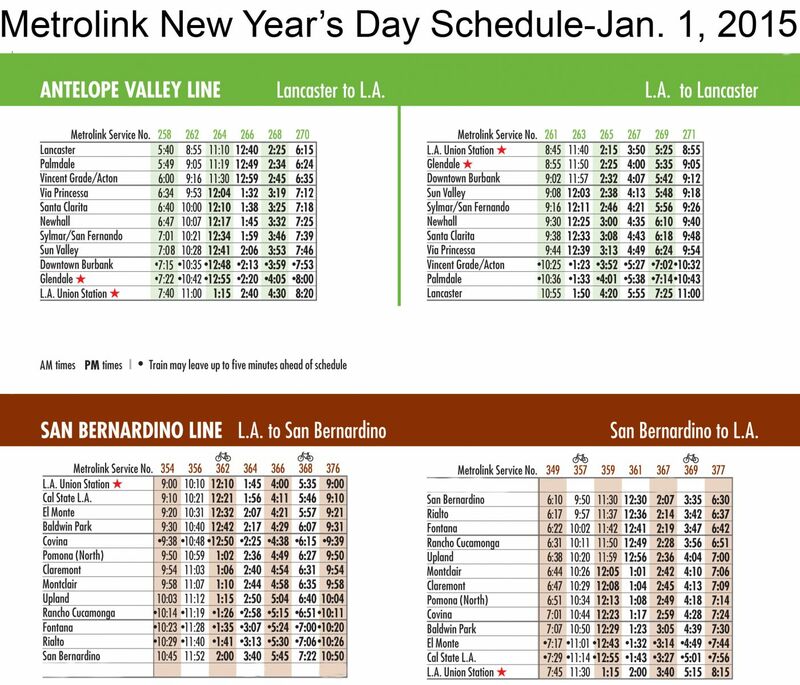 Metrolink is running service only on the Antelope Valley Line and San Bernardino Line on New Year’s Day; the schedule is below the map. Click here for the Metrolink website. The Los Angeles County Metropolitan Transportation Authority (Metro) will mark its 11th official year of Metro Rail service to the 2015 Tournament of Roses Parade® celebrations this New Year’s Day, providing public transportation directly to the world-renowned Pasadena parade events. The 126th Rose Parade® presented by Honda themed “Inspiring Stories”will feature majestic floral floats, high-stepping equestrian units and spirited marching bands from across the United States. Metro will provide fast, frequent train service to and from Pasadena all day, with four station stops near the parade route. Metrolink also will provide train service to access the parade from Union Station on its San Bernardino and Antelope Valley Lines. The Metro Gold Line opened in 2003, providing rail service to the 2004 tournament festivities. Prior to that, no commuter rail service had traveled to Pasadena in more than 50 years. The last Pacific Electric Red Cars were discontinued in 1951. With this year’s Tournament festivities planned to begin at 8 a.m. on Thursday, Jan. 1, 2015, Metro will be ready with all rail lines – the Metro Red, Purple, Gold, Blue, Expo and Green Lines, and the Metro Orange and Silver Lines – operating throughout the night on New Year’s Eve (Dec. 31-Jan. 1) to enable event-goers to get an early place along the parade route. In addition to the overnight service on all Metro Rail lines New Year’s Eve, Metro will run additional trains and more frequent service on the Metro Gold Line to accommodate the large numbers of anticipated riders. For New Year’s Eve only, Metro will provide free rides on all Metro bus and rail lines from 9 p.m. to 2 a.m. on the morning of Jan. 1. After 2 a.m., regular fares go into effect. Those attending parade festivities after 2 a.m. New Year’s Day can purchase a $1.75 one-way fare or an unlimited $7 Metro Day Pass on a $1 reusable Tap card. The Day Pass allows unlimited Metro system rides all day. 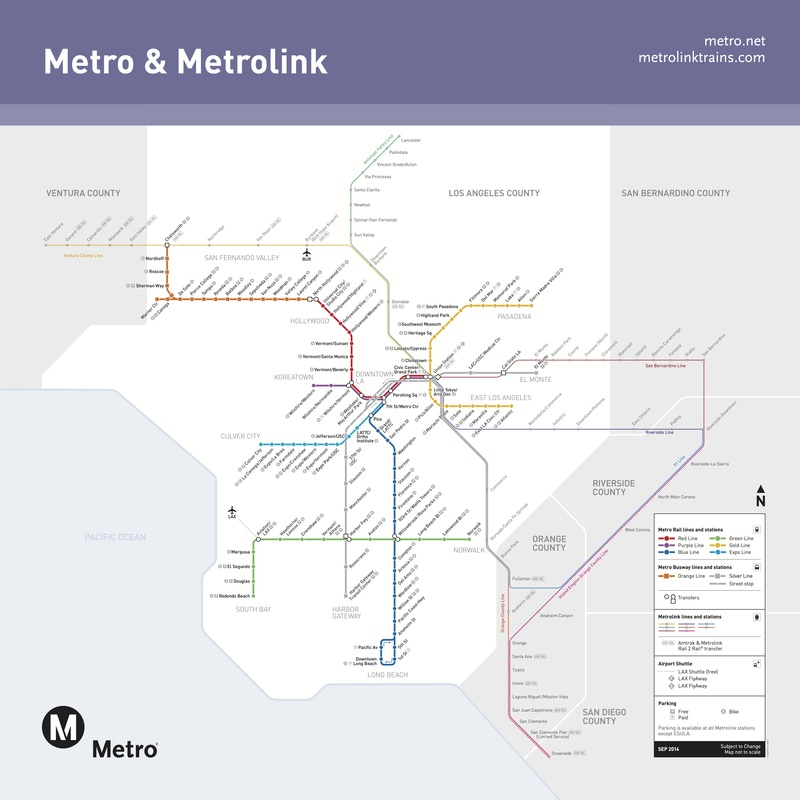 Metrolink will also provide service that will connect event-goers along its San Bernardino and Antelope Valley lines with additional transportation options to downtown Los Angeles Union Station, where they can board the Gold Line to Pasadena. Trains will run on a modified Sunday schedule. The first train on the Metrolink San Bernardino line will depart San Bernardino at 6:10 a.m. and make all station stops. Train 349 will arrive at Los Angeles Union Station at 7:45 a.m. From there paradegoers can ride the Metro Gold Line to the Rose Parade in Pasadena. On the Antelope Valley Line, the first train will depart Lancaster at 5:40 a.m. and arrive at L.A. Union Station at 7:40 a.m. The complete schedule can be found at metrolinktrains.com. Parade goers can access any of four Pasadena train stations close to the Parade route on Colorado Boulevard. Memorial Park and Del Mar stations are about two blocks from the Parade route; the Lake and Allen stations are approximately four blocks from the Parade route. Parking is available at several Metro Gold Line Stations, including Sierra Madre Villa, Del Mar, Fillmore, Heritage Square, Lincoln Heights/Cypress Park, Union Station, Indiana and Atlantic. Additional parking is available at stations serving other countywide rail lines. Visit metro.net for a list of additional park & ride lots on the Metro System. 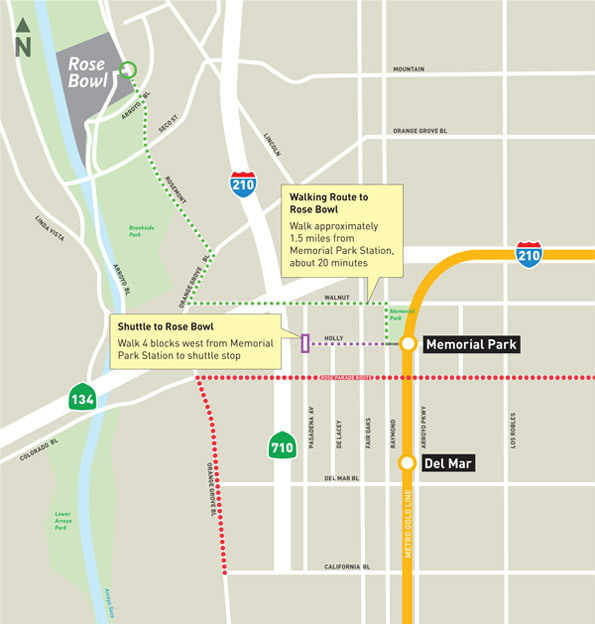 Football fans attending the 1:30 p.m. Rose Bowl Game® between Oregon and Florida State, presented by Northwestern Mutual, should take the Metro Gold Line to Memorial Park Station. Upon arrival at the station, they should then walk three blocks west on Holly Street to the Parsons Engineering Parking Lot B to catch the free Rose Bowl Game shuttle bus, with service starting at 10 a.m. and running continually until about two hours after the end of the game. Metro is also teaming up with the Tournament of Roses to provide easy access to view the Rose Parade floats after the parade. Take the Metro Gold Line to Sierra Madre Villa Station, the final station on the Gold Line. Then go to the first level of the adjacent Gold Line parking garage to board a shuttle that provides direct service to Victory Park, where the floats will be displayed Jan. 1 and 2. Shuttles will depart from Sierra Madre Villa Station until approximately 3 p.m. each day. Return service to Sierra Madre Villa will continue until 5:30 p.m. both days. Shuttle hours of operation from Sierra Madre Villa Station are 12:30 p.m. to 3 p.m. on Jan. 1, and 6:30 a.m. to 3 p.m. on Jan. 2. Shuttles will pick up every five to ten minutes. Regular fares will apply. On Jan. 2 and 3, from 7 a.m. to 9 a.m., the float viewing area will be open only to seniors and the disabled. Revelers also can utilize Metro Rail to access Grand Park in downtown Los Angeles on New Year’s Eve. The park is offering a free Countdown to 2015 event between 7 p.m. and 12:30 a.m. that includes live music, food, photo booths and huge projections. Metro riders who show their Tap card at any info booth and receive a free glow necklace. Eventgoers can take the Metro Red/Purple Line and exit Civic Center/Grand Park Station to access the event. Due to a New Year’s Eve event in downtown Long Beach, the downtown Long Beach Blue Line Station will be closed from 7 p.m. to 3 a.m. Patrons are asked to use the 1st Street Station or the shuttle train to Pacific Station as an alternative. The Blue Line will operate a modified service during this time. Trains will run every 10 minutes between 7th Street/Metro Center and Willow Street Station, and every 20 minutes between Willow Street and 1st Street Station. A shuttle train will run every 20 minutes between Anaheim Street Station and Pacific Avenue Station. Metro does not allow eating, drinking or smoking on board Metro trains or buses. To ensure public safety, Metro prohibits flammable products, barbecues and oversized items such as ladders, umbrellas, tents, chairs and coolers from being brought on board the Metro Bus or Rail system. For additional information on Metro, visit metro.net. The timetables are beyond confusing when you don’t know which bus to take and the trip planner doesn’t allow for specific dates, any suggestions on how to make it easier for someone who’s unfamiliar with which bus goes where? We’re trying to shuttle around Pasadena for the parade, float viewing and game. A street map showing where the stations are in relation to the parade would be helpful. The stylized system map doesn’t cut it for those not already familiar with the Metro. Will bikes be permitted on the Gold Line on New Year’s Day to get to the Parade? Bikes are permitted on board, but please be mindful of crowded trains and use the designated open areas. Bikes are also not allowed on escalators. For more tips on going Metro with your bike, check metro.net/bikes. Enjoy the parade! Do you know if the Madre Station parking structure will be filled up quickly by early Thursday morning? How early should I get there to get a parking space? Hard to say? It’s hard to say, but earlier will definitely be better than later. People will likely use SMV Station to get to the Rose Bowl Game and for float viewing after the parade as well, so it will be crowded all day. Any ridership estimates? How was it compared to past years? Was there good ridership between 2 and 6 am? I saw a bunch of Foothill Transit busses lined up on the Walnut over the 710. I would love to see comprehensive ridership stats. Also, the ToR and Pasadena need to promote transit.